Club Penguin releases one newspaper issue every week. They usually release these issues on Thursday. The newspaper usually talks about upcoming events or other interesting things around the island. This week the newspaper is mainly about the Prehistoric Party. Gary talks about the new DINO PUFFLES! If you click the button that says RAAWR then you'll be able to read more from Gary. He explains what we have to do to help the Dino Puffles and what we have to do to keep them as pets. Next, Gary admits to us that he doesn't know much about time travel. This leads us to believe that maybe something may go wrong when we time travel and it will cause some problems for us in the future. And of course we have the upcoming events section. 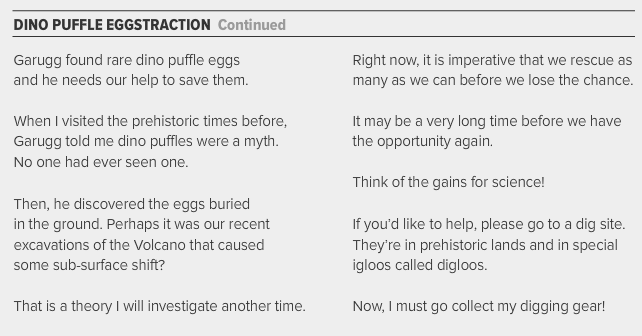 If you are new to CP, Club Penguin always lets us know about the upcoming events in this section.